Just wanted to share a quick picture of my current project. Mod Mosaic blocks, 12.5" square. This has to be gender neutral which is hard. I'm loving the way it's turning out though! I'm linking this up with Design Wall Monday over at Patchwork Times! You have finished some wonderful quilts lately. 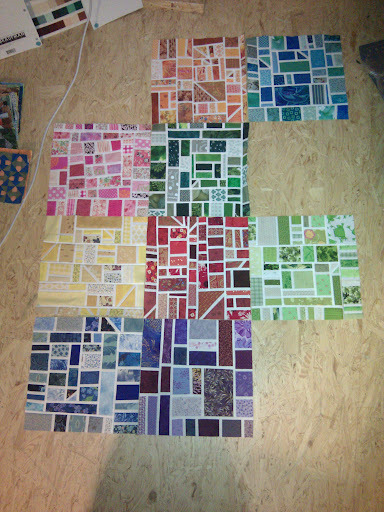 I really love your new project - looks great and its good to use up some scraps. I´ve found a pillow-tut in the www. in this style. Hope you guys are doing good! This is a very interesting technique. It sort of reminds me of stained glass windows with white instead of black spacers. I like the effect you are getting. OMG! That I love it! How are you doing this technique? I want to learn! Great looking blocks, you're doing a great job on your Mosaics! Oh I love these blocks. They remind me of the old flooring we found when we remodeled our house. I saved a piece of it to make a quilt like it.